Knowing where to get started was my number one cause of procrastination. However once I knew what I needed to do, I was away! Every Sunday, I will look through my courses, and see what is required for the week. 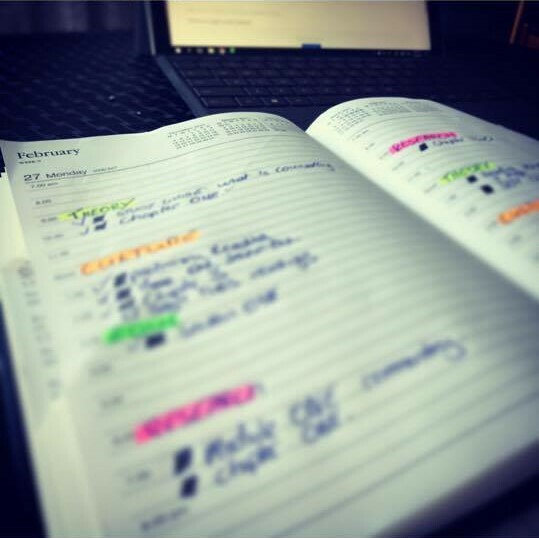 I then plan out what I will do on each day at specific times, so that when it comes time to get started, I am already set to get stuck in, and not be overwhelmed by a mountain of work! Keeping that mountain in mind, the only way to climb it is one step at a time. During the plan ahead process, I break the work required down into sizeable chunks. If a reading is really long, then I will read it one section at a time. When planning essays, I will break the essay down into sections approximately 200 words long, and will attempt to write one section a day in draft format leading up to the due date. All the planning and breaking down in the world will be no use if you don’t follow the plan! Make it your absolute non-negotiable to stick to the path you have laid out. Reward yourself: I schedule my weekends to be as free as possible to have a break. That becomes my drive to get the study done during the week. The last thing I want to be doing on a saturday afternoon is trying to finish of an essay when there could be a whole lot more exciting things I would rather be doing! Do everything you can to tick off that last box on your weekly planner checklist! Challenge yourself to get ahead! It’s always good to have a couple of days up your sleeve. I make a huge effort to try and get ahead of my plan, It’s easier to work harder on a Monday (sometimes!) than it is on a Thursday. I will try finish my daily allocation of tasks as quickly and thoroughly as possible, and then press on with the next day’s requirements. It may seem like a good idea at the time to relax and finish early at the start of the week, but I would much rather bank those minutes up for an early finish on Friday, or for insurance just incase I get thrown a curve ball. Distance Study doesn’t necessarily need to be tough, all it takes is a little willingness to apply some effort and craft some discipline into your approach. The investment you are making to the study and yourself is worth it!